1. Qualitone Type SH7 engraved panel, 30” long by 7” high by 3/16” thick. 2. Qualitone IF transformers (and probably Qualitone oscillator coupler). 4. Webster Electric Company tuning capacitors. 5. General Radio rheostat and potentiometer. 6. Benjamin UV type tube sockets. Top chassis view of the Qualitone superhet. The parts layout is excellent with very short leads to the plate and grid connections of most of the tubes. Most of the parts date from the 1924-1925 time frame, including the Karas “Harmonik” audio transformer, the Dublier mica and paper capacitors, and the UV type tube sockets. Two different views of the Qualitone filter transformer. This style of transformer is identical to the Klentz transformer. The transformer has a unique shape which means that there must be some connection between Qualitone and Klentz. There could be a connection with Webster Electrical Company also, because early Klentz transformers from 1924 had the same shape as Webster RF transformers from 1923. The Webster tuning capacitors in this set kind of tie things together a little bit. 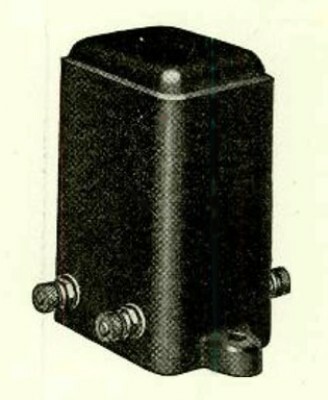 Webster RF transformer, as advertised in the April, 1923, Radio News magazine. Klentz IF transformer, as advertised in the Fall, 1924, Citizens Radio Call Book. Webster Electrical Company tuning capacitor. There appears to be some connection between Qualitone, Klentz, and Webster. Parts layout and schematic diagram for a Klentz superheterodyne described in the Fall, 1924, Citizens Radio Call Book. This layout and schematic is very close to the Qualitone superhet. The Klentz has two rheostats, whereas the Qualitone only has one. Close up view of the Qualitone oscillator coupler. Name tag affixed to the underside of the cabinet lid. This is a document that was found inside the radio. It shows the dial setting of the Heterodyne control (HET) and the Wavelength control (WAV) to pick up different stations. These stations were probably heard in the Texas area, because Dale Davenport purchased the radio at an auction in Texas in about 2001. Inside angle view of the Qualitone superheterodyne. Advertisement for the Klentz IF transformers as copied from the Fall, 1925, Citizens Radio Call Book. The Qualitone transformers appear to be identical to this style of Klentz transformers. Pressley< HOME >Radio Instrument Co.